We just survived Christmas, and I know there are a lot of us out there who consider Die Hard to be the best holiday movie ever made. Facing off against Hans Gruber and his gang of international mercenaries is harrowing indeed, but this new video that appeared at the end of last year imagines Bruce Willis’ John McClane tangling with two even more vicious foes, Predator and the Xenomorph’s from Alien. And with no further ado, here is Die Hard: Alien vs. Predator. Neill Blomkamp has a history of ambitious projects that don’t quite pan out. He’s delivered movies like District 9 and Elysium, and his robot-themed outsider story Chappie opens up this year, but there was also that big studio adaptation of Halo that never came together, among others. 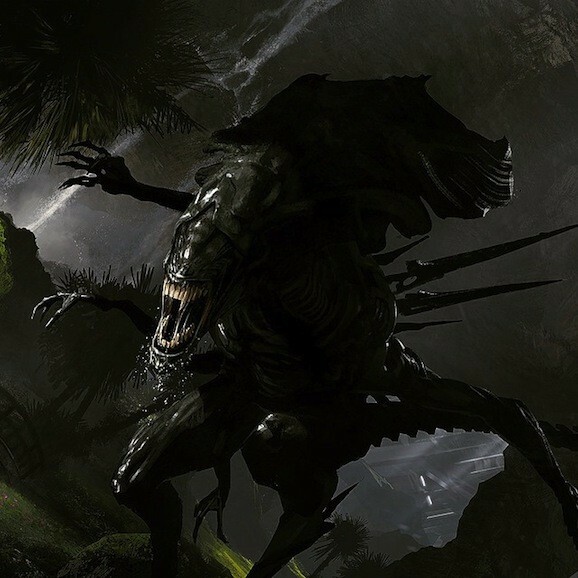 It looks like we can add another potentially awesome film to the pile of things that will never happen, as Blomkamp was apparently working on an Alien movie (in what capacity we’re not sure), and recently posted some concept art from the abandoned project. Blomkamp shared this art and information on his Instagram and Twitter accounts, and while he was definitely working on something, it doesn’t appear that this was anything that was ever going to happen, or anything that involved the studio in any way. In fact, it seems like he was just doing this for kicks, and in that regard this feels like fan art. But really awesome fan art. I don’t entirely know what’s going on, but I like what I see. IFC is not exactly synonymous with science fiction, but through their Midnight imprint, they’ve tacked the genre a time or two. Their catalog is primarily horror, but they dive headlong into sci-fi now and again, like with their upcoming alien invasion actioner Alien Outpost, which recently delivered this fancy new trailer. The thriller stars Highlander’s Adrian Paul, Rick Ravanello (The Cave), Reiley McClendon (Pearl Harbor), Douglas Tait (Star Trek), Joe Reegan (The Crazies), and Matthew Holmes (Salem), and is directed by Jabbar Raisani, who is most known for his visual effects work on things like Game of Thrones and Predators. It’s also found footage, which is going to automatically turn some of you off (I’m automatically skeptical of the format, though it can be used well on occasion). We’ve seen multitudes of alien races trying to destroy the Earth over the years—don’t worry, I’m only talking about in movies—but rarely are we introduced to aliens that actually want to save the planet. Meet Oh the Boov, as voiced by Emmy-winner Jim Parsons (The Big Bang Theory), who teams up with a young girl voiced by Rihanna for an otherworldly adventure filled with danger, explosions, and Sean Paul’s “Get Busy.” Check out the latest trailer below for Home and try not to embarrass me by dancing to it. We all know that DreamWorks Animation is a hit or miss studio, with movies like How to Train Your Dragon and Mr. Peabody & Sherman standing far above more forgetful affairs like Rise of the Guardians or whatever Madagascar movie they’re on now. And it’s rather hard to tell where Home is going to fall on that spectrum. For one, its cute alien main character thinks his name is “Oh” because all of his “friends” greet him with that exact exasperated exclamation, which is pretty clever. On the opposite side, there’s that eleven-year-old Sean Paul song, which Oh dances to and shakes his hands without caring. It’s scenes like this, which probably took months of storyboarding and animating, that exhibit everything wrong with Hollywood for children. This movie is partially aimed at people that weren’t even alive when that song came out. Widening the scope beyond dancehall hits, Home sees the Boov alien race—far from the smartest in the universe—invading Earth to use it as a hiding spot, as they’re trying to stay outside the scope of their enemies. 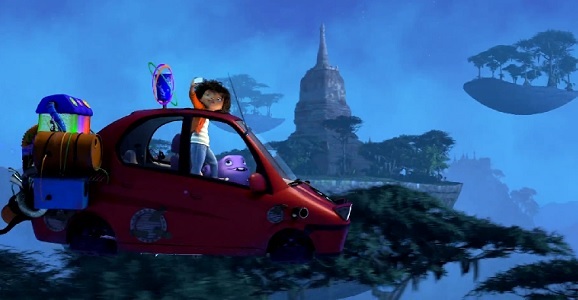 Thinking that they’re helping out, the Boov begin to relocate humanity, but one young girl, Tip (Rihanna), heads out on the run, where she meets up with Oh, who accidentally alerts the alien enemies to their location. That’s presumably once the more visually fantastic things in the trailer happen, as there are a lot of large-scale disasters, both on and off the planet. Perfect time to take a picture. Home is based on the beloved children’s novel The True Meaning of Smekday, written by Adam Rex in 2007. Rex has a sequel coming out, Smek for President, in February 2015, so if DreamWorks makes bank with Home, you can bet they’ll head straight into production on that sequel. Also starring Matt Jones, Jennifer Lopez, and Steve Martin, Home isn’t set to invade theaters until March 27, 2015. Which means “Get Busy” will be even older then. It’s been a long time coming, but Alien: Isolation, the long awaited video game from Creative Assembly that takes players back to the universe first created by Ridley Scott in 1979, drops tomorrow. To mark the occasion, there’s a terrifying new trailer that provides our most comprehensive look at the game yet, and the view is pretty damn impressive. The most noteworthy thing about this video, aside from how great the game actually looks, is how they capture the tension and the feeling of terror and horror as you’re being hunted by an armor plated alien killing machine through a dark, dank, isolated environment millions of miles from home. If nothing else, this game feels like an Alien movie in the way the dread is overwhelming and chilling. 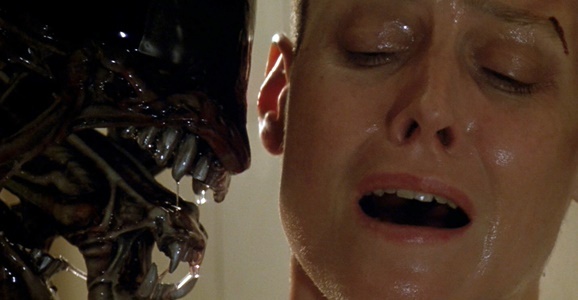 And it doesn’t hurt that the glimpses of xenomorphs will likely send shivers running up the length of your spine.